We are delighted to announce that several Waitrose & Partners stores in Westminster have decided to support Westminster Befriend a Family this Christmas. Recently the branch in Belgravia handed over £380 to us from generous customers choosing our charity to give their ‘green tokens’ to, and we received almost £400 from the Waitrose & Partners branch in Bressenden Place near Victoria Station. We are absolutely delighted. Thank you to Waitrose & Partners and thank you to their customers. 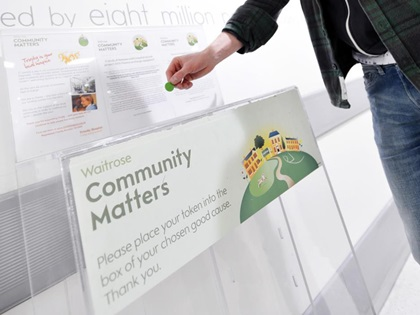 If you intend to shop in any Waitrose & Partners store in Westminster this December, please keep your eyes open for a Westminster Befriend a Family charity bin where you can drop your green tokens. It really does raise money for a great local cause – helping some of the most disadvantaged and vulnerable families in the borough help themselves.